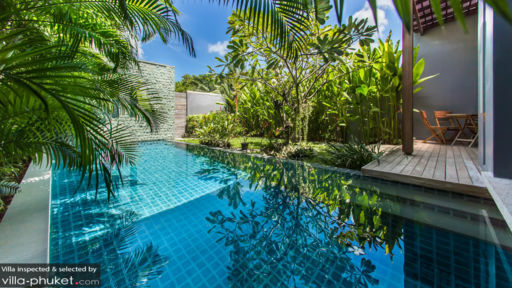 On the beautiful island of Phuket, situated close to Nai Harn beach, is the sprawling Villa Awa with two spacious bedrooms and a walled garden, affording security and exclusivity to its guests. 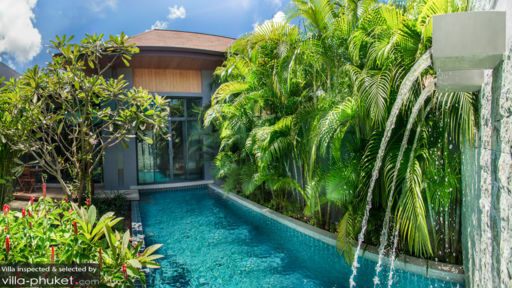 Lush green gardens and tropical foliage enhance the beauty of the entire property and the master bedroom connects directly to the lavish swimming pool set in the outdoor yard. Villa Awa is the place to be, if you are looking for a perfect tropical getaway with your loved ones! There are two bedrooms at Villa Awa, and each of them is well-furnished with king-sized beds and armchairs. Both of the rooms are air-conditioned to keep them cool and comfortable for resting. The main bedroom opens right out to the swimming pool, allowing you to dive straight out as you slide open the glass doors. There is a large private bathroom for the bedrooms, which is fitted with modern amenities like a showering area, and a large bathtub for your convenience. The contemporary living area connects to the outdoor yard through glass doors which open out directly to the pool deck. The modern space is well-decorated with artwork on the walls and swanky furniture. It is a comfortable room, furnished with plush and cosy couches and armchairs for your lounge on lazy afternoons. There is a large flat-screen TV placed in front of the sitting area, where you can relax and watch a film if desired. 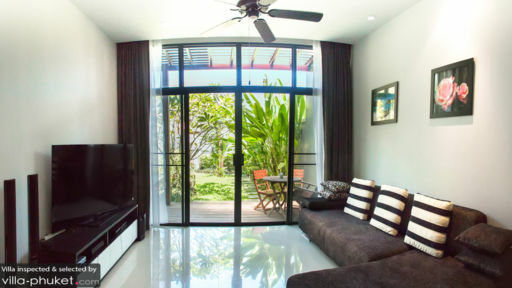 The room is flooded with natural lighting during the daytime, and a calming night breeze once the sun sets. Following the sitting area, is the dining area furnished with a square wooden dining table, which can easily accommodate up to four guests, without a worry. The aesthetically pleasing and inviting area also has a fully-equipped modern kitchen, which is quite spacious and comes with all necessary appliances and amenities. There is a separate laundry room also available for the guests’ use, which you can utilise as per your convenience. The friendly and kind staff at Villa awa are there to take care of you during the entirety of your stay in Phuket. They will be happy to assist you with anything you require and even recommend places to visit on the island. There is regular maintenance and upkeep of the villa, so all you need to do is to sit back and relax! Nai Harn Beach is only a 3-minute drive from Villa Awa, which gives you the opportunity to indulge in watersports or go swimming while you are in Phuket. As this is a popular place for sailing, it would be a great experience! Also, there are several restaurants in the neighbourhood offering multiple cuisines that you can try out!